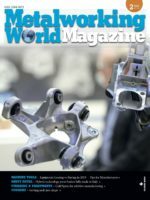 A New Production Technology Is Emerging And, Unlike Conventional Machining, It Produces By Adding Material, Instead Of By Subtracting It. It Is A Young Technology But Anyway Promising Great Revolutions In Production Processes. The origins of Additive Manufacturing are quite recent, considering that the first successful results, even if in quite meagre and primitive way, date back to Seventies of the last century, although, according to some authoritative opinions, already in 1800, in topography and photo sculpture, we can find the precursors, or the roots, of the additive technology. It is a fact that the true input is due to a project developed in the research laboratories of MIT, the Massachusetts Institute of Technology in Boston, one of the most prestigious Universities in the world, whose lenders were the US Office of Naval Research and the National Science Foundation and, as first promoting company of the production, Extrude Hone Corporation (today ExOne Company) that, in 1996, obtained the exclusive licence of the additive technology, known as 3D printing process, developed by MIT. It is a fact: the additive technology is changing the standard concept of production process and, more upstream, of design of the manufactured good. The Additive Manufacturing is today a ready technology, thanks to the strong customization possibility, the prototyping speed and the economic and social implications, last but not least the man and environment protection. With a term nowadays deemed outdated, yesterday we spoke of Prototyping, today we prefer talking about Manufacturing, but we always refer to a process of additive type, commonly considered a 3D printing process. The technology on which the Additive Manufacturing is based is relatively simple: items are manufactured by adding material, layer after layer, starting from a 3D computerized model. Actually, the definition “Additive Manufacturing” includes several technologies, all of them anyway grounded on the same base points: a three-dimensional CAD model, whose mathematics is converted into STL format, which discretizes the surface according to opportune triangles, thus creating what is called surface tessellation; the transfer of the STL file to the additive manufacturing system, for the piece construction; the geometry subdivision into horizontal “slices”, with variable thickness, depending on what you want to obtain. Various are the suitable materials for the Additive Manufacturing, as well as different are the used techniques. Concerning materials, which are often in the form of powders, but not necessarily, we range from polymeric materials up to Titanium or Chromium-Cobalt alloys, or anyway materials that show criticalities in the standard tool machining. Regarding the additive techniques, it is worth mentioning the Stereolithography (SLA), the Selective Laser Sintering (SLS), the Selective Laser Melting (SLM), the Direct Metal Laser Sintering (DLMS), the Fused Deposition Modelling (FDM), the Drop on Demand (DOD), etc… All these techniques share the fact that the piece “grows from nothing” instead of being excavated from a solid or a semi-finished part, even if with different modalities and purposes. In Stereolithography, for instance, the section of a piece is traced: since the laser yields energy, you obtain the resin polymerization, thus creating a first solid layer to which another layer of liquid material is added, and the process is repeated until the complete manufacturing of the piece, which is generally a prototype. In the Drop on Demand, through two nozzles are deposited micrometric drops of a thermoplastic material, very similar to wax, for the construction of models. This technology couples the additive method with the subtractive one, typical of CNC, since a cutter provides for flattening the layers gradually deposited, in order to implement even very precise prototypes. In the Selective Laser Sintering, which can be plastic, metallic or with sand, the direct powder sintering by layers is performed by a piloted laser beam. The process is unmanned and completely automatic and it allows the rapid implementation of pieces made of definitive materials. 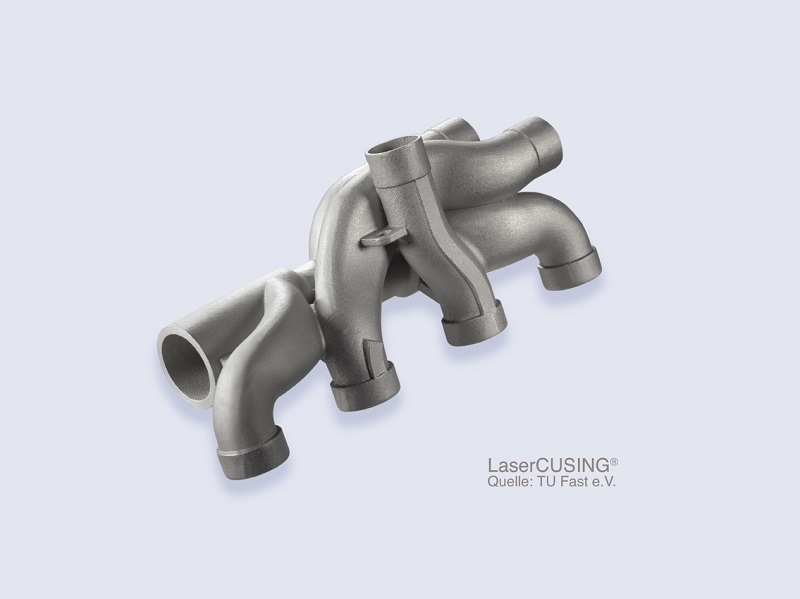 Similarly operates the Direct Metal Laser Sintering: the manufacturing is accomplished by bonding fine metal powders with thermal effect, performed by the passage of the laser beam on the successive sections of the object in production. The “additive” designer has no more to cope with the binds dictated by production techniques. This means the possibility of conceiving and implementing components with complex geometries and of opening new frontiers to materials. All that leads to a revolution of the standard design canons introducing DFAM (Design For Additive Manufacturing), whose goal is defined by Gibson, Rosen and Stucker in Design for Additive Manufacturing as “the maximisation of the product performances through a synthesis of shapes, sizes, hierarchical structures subjected to the potential of additive technologies”. Therefore, the “additive” designer no more worries about undercuts, he can play with thicknesses, reinforcing or streamlining just according to the requirements, without worrying about the production troubles, thus knocking down the taboo of the variable thickness. 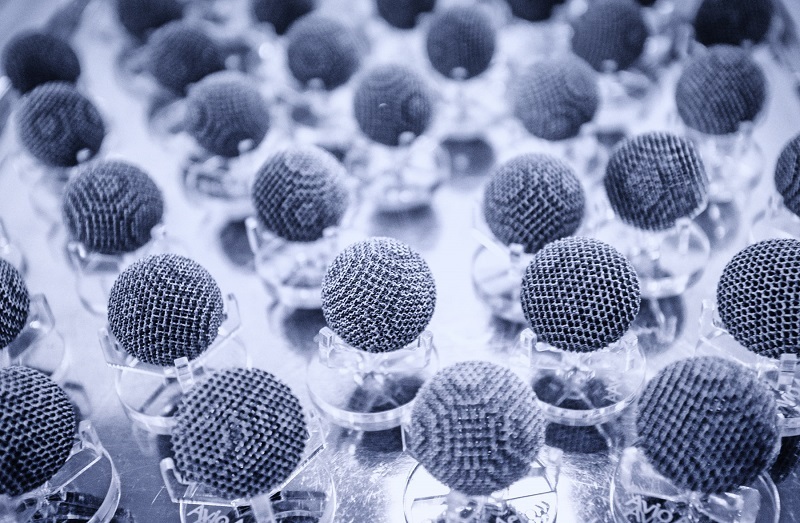 The Additive Manufacturing technology derives from the Aerospace sector, which is still the reference market, despite the important development of numerous other applications, like the biomedical industry. The aerospace drives towards the research of new materials and new design solutions able to optimize the resistance/weight ratio, trying to decrease the weight and the quantity of the used material, granting the performance and functional requisites requested. Ideal for the Additive Manufacturing that, thanks to the various laser sintering processes, but not only, can stake also on materials like Superalloys, TiAl, Cr-Co alloys, etc, and which, just thanks to its concept, allows the reduction of the number of parts: against a redesign, it is possible to produce an assembly like a single component, integrating possible joints and hinges. Therefore the original design must be optimized, “thinking additive”, as operators say, in order to obtain the best results, both in terms of mass reduction and of performance. 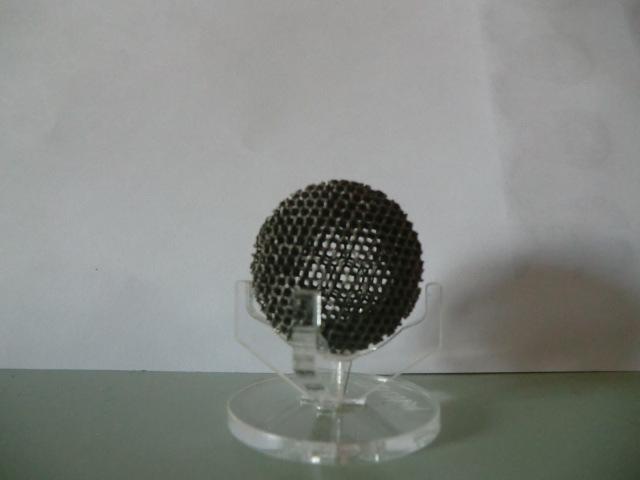 The additive technology offers several advantages, in comparison with the traditional one. Speed is perhaps the first of all: no starting rough pieces or semi-finished products are necessary, but the piece (or the prototype) are manufactured at the moment, as needed. All that has a beneficial repercussion on costs, for several reasons: first of all the product is optimized, then a significant saving of raw material is attainable, then, being the manufacturing on demand possible, stocking costs, from the raw material to the finished product, are drastically decreased, as well as possible transport costs. Besides, the design freedom allows executing modifications in simple and fast way, since the constraints connected with tooling and machining disappear. The possibility of creating manufactured goods with shapes that conventional techniques could not produce leads to a more efficient design, with manufactured articles able to perform their function better. Last but not least, and anyway at present a bit futuristic, both design and production can be in house accomplished, that’s to say wherever the manufactured product is requested. It might be the case of airports, or anyway of hangars for the aircraft overhaul: if, on site, was present an Additive Manufacturing system, the requested spare part might be available in very short time. At present, however, the Additive Manufacturing has a limit, represented by the workpiece sizes and by the choice of materials, which is still relatively limited and generally oriented to particular materials, such as Nickel Superalloys, Titanium and Chromium-Cobalt alloys. We should anyway remind that, in various cases, secondary machining operations are requested, for instance the removal of supports or polishing. Finally, it is worth highlighting that, if until few years ago, the Additive systems had relevant costs, today, thanks to the technological evolution, also small and medium enterprises can take advantage of this technology. 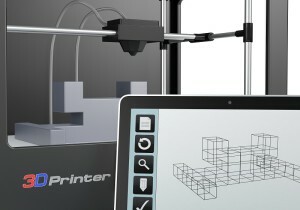 Born from a project, then patented, of MIT in Boston, the 3D Printer provides for the use of commercial cartridges that, instead of spraying ink, spray a glue-based liquid on a layer of material, like starch or plaster, but also ceramic powder, so that, layer after layer, a 3D model is consolidated on the table. At present the 3D printer is deemed the absolutely quickest machine for rapid prototyping, able to create physical models in very short times ( even less than one hour), models that can also be painted or metalized, all that in simple and reliable way. Applications are various, typically design and/or ergonomics verifications, construction of models for silicone moulds and lost wax castings.